Matthew Parris's Parting Shots is a treasure trove of wit, venom and serious analysis. Up till 2006 a British Ambassador leaving his post was encouraged to write what was known as a valedictory despatch, to be circulated to a small number of influential people in government. This was the parting shot, an opportunity to offer a personal and frank view of the host country, the manners and morals of its people, their institutions, the state of their cooking and their drains. But it was also a chance to let rip at the Foreign Office itself and to look back on a career spent in the service of a sometimes ungrateful nation. 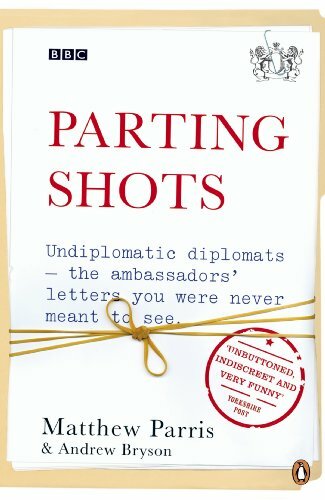 Combining gems from the archives with more recent despatches obtained through the Freedom of Information Act, Parting Shots sheds light on Britain's place in the world, revealing the curious cocktail of privilege and privation that makes up the life of an ambassador. Matthew Parris had a short career in the Foreign Office where one of his tasks was to distribute incoming valedictory despatches. He was a Conservative MP from 1979 to 1986, since when he has worked as a journalist. He is the author of A Castle in Spain, Parting Shots, and A Spanish Ambassador's Suitcase. He divides his time between Derbyshire (where his old constituency was situated) and east London. Matthew Parris had a short career in the Foreign Office where one of his tasks was to distribute incoming valedictory despatches. He was a Conservative MP from 1979 to 1986, since when he has worked as a journalist. He won the Orwell Prize for Journalism, and his acclaimed autobiography Chance Witness was published by Penguin in 2002. He divides his time between Derbyshire (where his old constituency was situated) and east London. Andrew Bryson is a radio journalist working in the BBC's Business and Economics Unit. He lives in Surrey.